Power windows are a fantastic, practical modern invention. Without them, people would be forced to crank open their windows in everyday situations. Although the parts that provide power and physically lift and lower the window are reliable, occasionally a component will fail. Many car owners have encountered problems where a window stops working, chatters during operation or rattles when going over bumps. These problems could be due to a fault in the armrest controls or due to a mechanical failure inside the door. It is also possible for windows to break if force is applied to the glass or if a component fails suddenly. In this case, you might need to call a Houston auto glass company to reseat the window or to install a replacement. Power windows in cars are very similar to old manual systems, except electrical motors are used to move the components rather than a hand crank. This is accomplished by an X-shaped or V-shaped part known as a window regulator or lifter. This component interacts with a series of gears that are powered by a small motor. When the gears turn, the angle between the regulator arms changes. As the angle becomes increasingly acute, the window will be pushed up to the highest point. As the angle widens, the window will go down to the lowest point. Additional stability is provided by a horizontal bar that locks around the base of the window and attaches to the regulator arms. Installing new side windows is a little different than Houston windshield replacement because the glass panels move and need to interact properly with the stabilizers and mechanical parts. Everything that happens inside your door when you open or close the car window requires power from the car battery. Wires run from the battery to a central power box and protective fuse compartment before making their way into your armrest. The configuration of the power supply varies depending on whether you have power locks and power windows only or multiple controls in the armrest. If you have power mirrors, seat adjustment features and other controls, your car probably has a central power distributor. This component diverts power to different motors and gears, which allows you to adjust the side mirrors and open or close rear windows and those on the passenger side. Clever variations in the power supply and motor sensors provide a number of features that enhance convenience and safety. When you push the down side of the button, the gears turn one way. When you want the window to go up, the current is reversed, and the gears spin in the opposite direction. You will also notice that car windows cannot be pried open. That is because the screw-like worm gear forces the teeth of the gears to lock together when the motor is not running. Another common feature opens the driver’s window all the way with one touch. This is due to a simple variation in the relay. If the button is pushed for a longer duration, it will stop moving when pressure is released. Other features are for safety. For example, if the motor slows or strains, the gears will reverse themselves to prevent an obstruction from becoming trapped in the window, which could cause potential injuries. 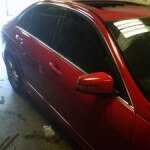 If a window in your car is broken, cracked or needs replacement, call Apple Glass. We specialize in glass repair in Houston and The Woodlands. We have two convenient locations that stock a wide selection of auto safety glass designed to fit windshields, side and rear windows for all makes and models. 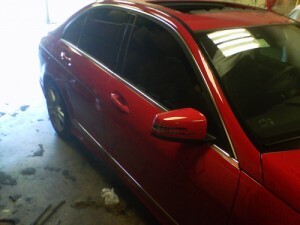 We can also provide tinted glass to ensure that your new window matches the rest of your car. This entry was posted in Power Windows and tagged Glass Repair Houston, Houston Auto Glass, Houston Windshield Replacement. Bookmark the permalink.